MARCH 27, 2019: Working in conjunction with the Texas Retired Teachers Association (TRTA), Mass Retirees has reinitiated an all-out effort to pass legislation to reform the Social Security Windfall Elimination Provision (WEP) and Government Pension Offset (GPO). 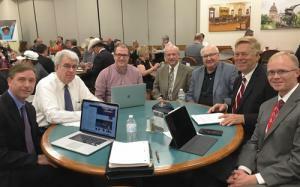 Valeri, Association Legislative Director Shawn Duhamel and Mass Retirees’ federal advocate Tom Lussier traveled to Austin, Texas early this week to meet with TRTA officials and map out a detailed plan to move federal legislation through Congress. Passed by Congress and signed into law by President Reagan in 1983 (36 years ago! ), the WEP and GPO have ever since been the focus of anger and despair by those retired from public service jobs outside of the Social Security system. The two laws reduce and, in the case of the GPO, can eliminate the Social Security benefits of more than 1.8 million public retirees across the country. Massachusetts is one of a handful of states where the public workforce does not participate in Social Security. CA, CO, IL, LA, OH and TX are the other primary states largely outside of the federal system. However, across the nation 2/3 of all public teachers and more than 60% of firefighters and police officers are outside of Social Security. Social Security is funded through the federal payroll tax, with employees paying 6.2% of their salary into the system and their employer paying a matching 6.2% contribution. For 2019, the maximum Social Security benefit is $34,000. Over the past four years a series of proposals have been filed jointly by Congressmen Kevin Brady (R-TX) and Richie Neal (D-MA) that are designed to provide WEP relief for those currently victimized by the WEP, as well as create a new fair Social Security formula for all retirees. A first rendition of the proposal emerged in 2016 as H.R. 711. That July the bill was derailed by concerns over the potential impact on future retirees just moments before it was scheduled to be favorably released by the House Ways and Means Committee. Efforts to advance subsequent legislation in 2017-18 fell short, largely due to national politics. With Democrats now holding the majority in the House and Neal serving as chair of Ways and Means, the decision was made to reset the WEP reform proposal. Mass Retirees and TRTA officials are focused on improving benefits for existing WEP victims, as well as expanding the proposal to include relief from the GPO. HR711 and subsequent proposals did not address the GPO. “Our goal is to pass a law reforming both the WEP and GPO. This should include a monthly rebate for WEP victims that can provide meaningful relief for retirees. We also need to end the ongoing GPO offset of COLAs and find a way to provide a minimum safety net benefit,” explains Duhamel. “For future retirees we’re working to create a fair formula that properly accounts for time spent under Social Security vs. a non-Social Security plan. This includes crafting a way to hold those close to retirement age harmless from any negative impact that might come from changing the formula. Once passed into law, the rebate would likely take effect within a year. Such a plan would provide existing retirees impacted by WEP and GPO with a monthly increase in their Social Security check going forward. Over the past six years Mass Retirees and the TRTA have spearheaded an informal national grassroots coalition of public retiree organizations, public employee unions and the AARP in a joint effort to reform both the WEP and GPO. Members include organizations from states most impacted by the two federal offset laws. As part of the group’s renewed efforts, a plan is now in place to formalize and grow the scope of the coalition. Part of the coalition’s effort will be to convince those organizations continuing to fight for full repeal of WEP and GPO to join the reform effort. Not only does this effort seriously lack the votes to pass a full repeal law through Congress, such an effort would result in some public retirees receiving a higher Social Security benefit than they earned – ultimately guaranteeing that the votes will never be there in either branch of Congress. The original intent of the WEP was to ensure that those retired from positions outside of Social Security would no longer receive an enhanced benefit. Due to the lack of accurate data and computer programs in the early 1980s, the WEP law overcorrected taking too much of the Social Security benefit away. Mass Retirees, TRTA and other coalition partners continue to work with Congressional leaders to craft a formal legislative proposal. A new hearing by the Social Security Subcommittee is now expected to take place in the coming months.